Check out our glowing reviews below before giving us a call. “Bathroom Basics designed, supplied, and fitted our family bathroom. The family-ran business made it a pleasurable experience from start to finish. The sales team and designers were very experienced and put all of our other quotes from other competitors to shame. Nothing was too much trouble as they offered superb ideas and designs that afforded us a fantastic fitted bathroom." “The bathroom fitters (Sepi and John) arrived promptly and were extremely efficient, tidy, professional, and an absolute credit to the trade and company. Hopefully the company will be expanding soon and providing kitchens as that is next on our list." “I would recommend Bathroom Basics to any of my family and friends, having shopped around for a while prior to the order. The team at Bathroom Basics looked after us so well and made everything so personal that I wish I hadn't bothered getting quotes from the others." 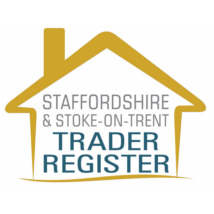 Contact our bathroom company in Stoke-on-Trent, Staffordshire, to discover why so many people choose us for their home improvements.